Cacio e Pepe is a simple yet elegant Italian pasta dish, made with fresh Pecorino Romano cheese and black pepper tossed with spaghetti. This rich and creamy dish is made with just a few ingredients, making it an easy weeknight dinner. There are also some suggested wine pairings included with the recipe as well. 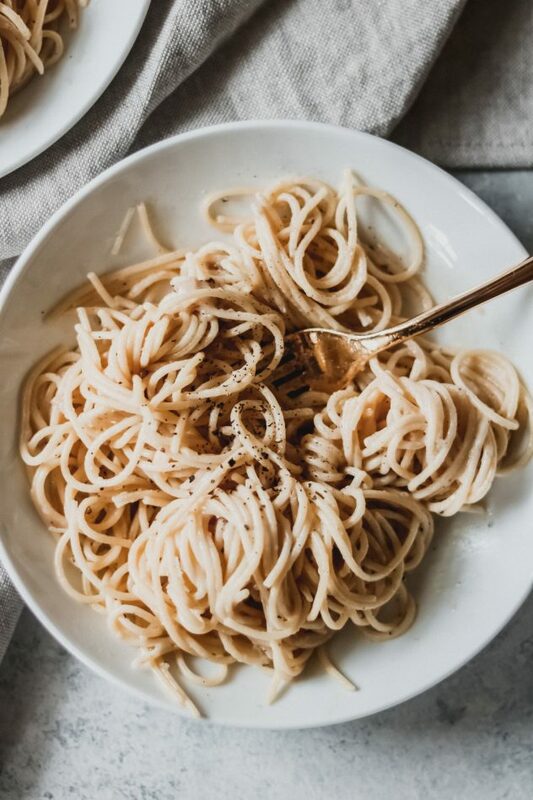 You know we’re all about simple yet elegant eats here at Wanderlust and Wellness, and this classic Cacio e Pepe dish truly captures that vibe. 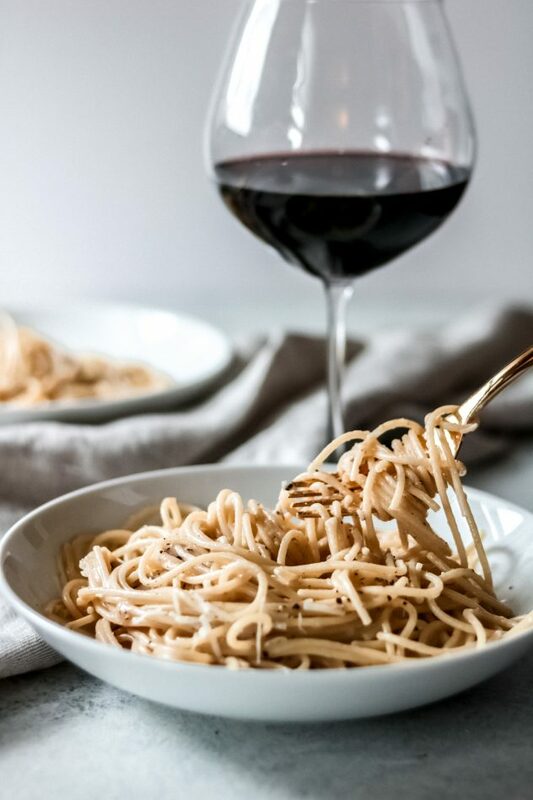 Cacio e Pepe is a Roman cuisine that means “cheese and pepper” – because just as the name suggests, the ingredients are as simple as pasta, cheese, and pepper. I’ve included a little butter in this recipe to amp up the overall richness of the dish. When I said this dish only requires a few simple ingredients, I wasn’t kidding. That’s it! The key in making this dish is the process (and that heavenly pasta water you always hear the cooking shows mention…it really does make the sauce!) I’ve made this dish a total of three times and the first time was an absolute flop. I quickly realized that the key to a velvety rich and creamy sauce was vigorous speed while mixing. Otherwise, you’ll end up with a chunky sauce that looks less than appealing. I’ll go into all of the specific details in the recipe directions below. Lastly, let’s talk about wine. When we’ve chatted over on Instagram stories (which, by the way, if you’re not following us over on Instagram, come on over! We do a lot of chatting behind the scenes via Instagram stories. ), many of you mentioned you don’t pair wines with your meals. Which, I can understand. 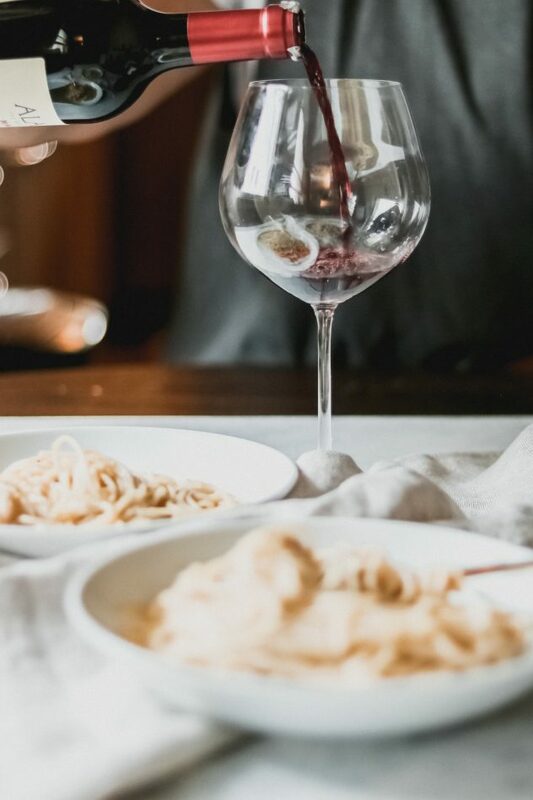 However, the more I’ve expanded my palate for wines I have realized that there is, in fact, the reasoning behind wine and meal pairings. 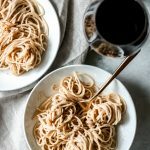 I decided I’d share with you my recommendations for wine pairings with a rich and creamy meal such as this Cacio e Pepe. While Cacio e Pepe is rich and creamy, it also carries a bit of a spicy kick due to the cracked black pepper. Because of this, I would suggest a full-bodied white wine or a light-bodied red wine. Also, please note that I am not a wine pairing expert, these are my suggestions based on personal experience while taking into account affordability and access. Of course, with any wine pairings, you’ll have to try various types and see what your pallet prefers. Also, don’t be afraid to venture out to local wineries and try local varieties that match up with these traditional wines. Enjoy these additional pasta dinner ideas! 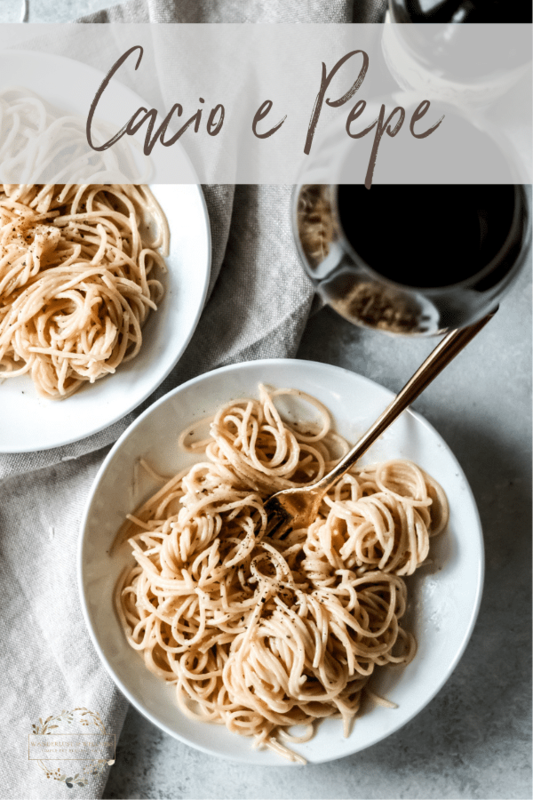 Cacio e Pepe is a simple yet elegant pasta dish made with only a few simple ingredients. Bring a large pot of water to a boil over high heat. Add the salt to the water and let dissolve. Add the spaghetti pasta and cook until al dente. While the pasta is cooking, melt the butter in a medium-sized skillet. Add the cracked black pepper and cook until fragrant, about 1 minute. In a large mixing bowl, add the finely grated Pecorino Romano cheese, the melted butter and pepper, and about 3/4 cup of the pasta water. You want the water to be hot. Using a spoon, vigorously mix the ingredients to form a smooth paste. When the pasta has finished cooking, strain the pasta, keeping the pasta water reserved. Immediately add the hot pasta to the bowl with the cheese paste and begin to toss vigorously. Keep tossing quickly until the cheese is fully melted and pasta is coated with the creamy sauce. Add additional hot pasta water one tablespoon at a time, as needed. Once the pasta is fully coated and the sauce is smooth and creamy, immediately serve and top with additional grated Pecorino Romano cheese and black pepper.